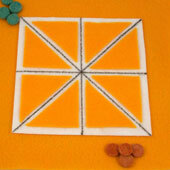 In this project, make a felt or paper game board for Achi, a game from Ghana which goes beyond tic-tac-toe. Children play similar games all around the world. Some of the oldest games, dating back over 3,500 years, are in a group called games of alignment. 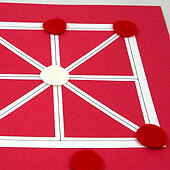 Tic-tac-toe is one of the most popular of these games in the United States, but in Ghana the children play Achi. At the end of this project page, learn more about the history and rules of Achi, and find links to other sites with more fun and information related to Achi and Ghana. Optional supplies: Fabric glue instead of needle and thread, or a regular black marker and glue stick for a paper board. 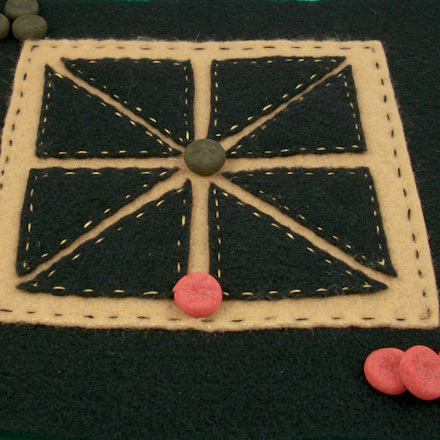 Bonus pattern: Use the Picaria templates to make a game board for another 3-in-a-row game from the Pueblo Indians of New Mexico. 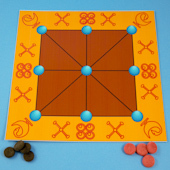 For how to play Picaria and additional patterns, see Picaria Game Board Patterns. Easy Game Board: The Printable Game Board pattern can be used to make a simple print, cut and play game board. Just follow the instructions in the English Board Solitaire craft project. Cut a 6" square from the lighter felt (or paper). 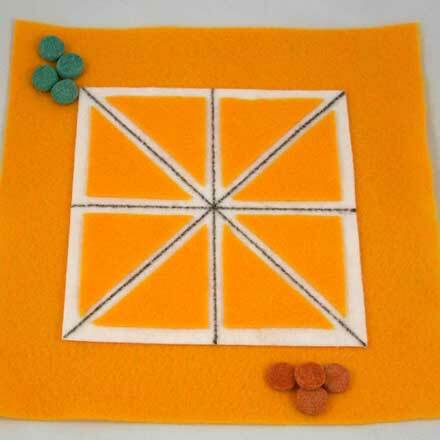 Cut the darker piece of felt (or paper) into a 9" square and four 2.25" squares. Cut each of the four 2.25" squares in half on the diagonal. Picaria: Cut the squares a second time on the diagonal. As an aid in cutting, you can pin the pattern templates to the felt, or use a ruler and pencil or chalk to measure and mark the squares. Using the printed pattern as a guide, draw four lines on the 6" square of lighter felt with the black permanent fabric marker. Draw two diagonal lines, corner to corner, and horizontal and vertical lines that go through the point where the diagonal lines cross. Picaria: Draw four additional lnes joing the mid-points on each side. The game lines are optional, but without them, placing the triangles accurately will be more difficult. Pin the felt triangles to the 6" felt square. Center each piece in a triangle created by the drawn lines. For a paper board, glue the triangle pieces centered in the triangular spaces created by the drawn lines. Pin the 6" felt square in the center of the 9" felt square. Stitch the squares together with 3 strands of embroidery floss, using a running stitch about ¼" from the edge of the 6" square. For a paper board, glue the 6" square in the center of the larger square. That's it! Your game board is done and now it's time to play! Achi is a two-player game. Each player needs four game pieces in a color that contrasts with the other player's game pieces. Two different dried beans, like red kidney and white Great Northern, work well; alternatively, use pennies and dimes. 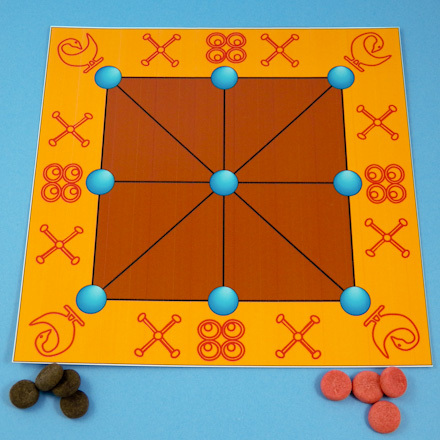 The object of the game is to be the first player to align three pieces in a row. Draw lots to see who goes first. Players take turns putting playing pieces on any line intersection. The game moves into its second stage after all pieces have been played and no one has three in a row. Players now take turns moving one of their pieces along a line to an empty spot. No jumping	allowed. The first player to get three in a row wins. The row can be horizontal, vertical, or diagonal. When were Achi and Tic-Tac-Toe invented? Children play similar games all around the world. Some of the oldest games, dating back over 3,500 years, belong to a type of game called games of alignment. Tic-tac-toe is one of the most popular of these games in the United States, but in Ghana the children play Achi. They usually mark the game board on the ground and use little sticks as playing pieces. One player will have four little sticks with the bark on, and the other player will have four sticks with the bark off. A game board like those used for Achi was found carved into a roofing slab of the temple at Al-Qurna in Egypt. It dates from 3,500 years ago. In addition, Confucius describes the game of yih that was played in China as far back as 500 B.C. ; yih is now called tic-tac-toe. There are many other historical references to alignment games from around the world. Two boards dating from 2,000 years ago were found in Sri Lanka. Other references come from Rome, Crete, Ireland, and Norway. Family Games Treasurehouse: Nine Holes: Here's a simpler game of alignment, called Nine Holes, that you can play using your Achi game board. Adinkra Symbols of West Africa: Adinkra are African symbols frequently used in Ghanaian culture. Click on the symbols or search the index to view larger versions and read both the literal translation of the adinkra and the more abstract concept behind it. 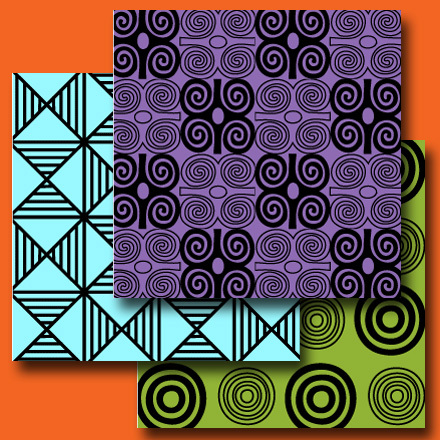 Tip: These ePapers feature Adinkra symbols from the Asante of Ghana in west Africa. 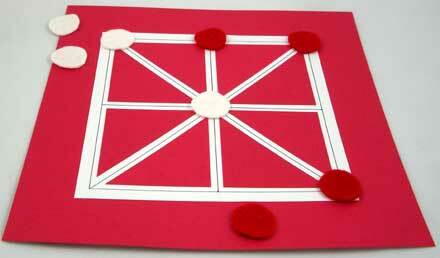 Use one of Aunt Annie's Adinkra ePapers to make gift cards or to decorate a paper version of the Achi game board. 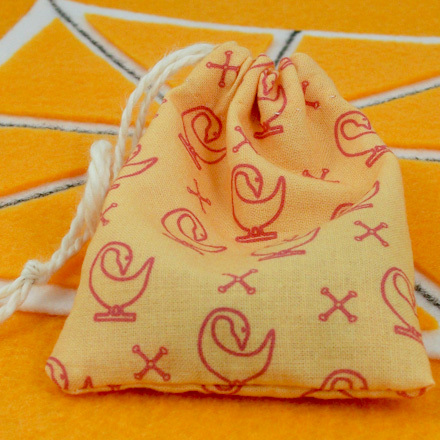 Tip: The Adinkra ePaper can be printed onto fabric to make a small bag for game pieces. This bag was made with a 5" square of fabric seamed on the side and bottom with a casing for the drawstring folded over at the top. A small gap in the side seam about 1" from the top allows for threading of the drawstring. 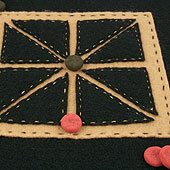 Tip: Felt game boards can be made with fabric glue. The pictured game pieces were made with Homemade Modeling Dough. Tip: The game board can also be made from paper or cardstock. Cut the triangle and square pieces as for the felt board, then glue them in place. Punch circles from cardstock to make playing pieces. Tip: The Printable Game Board pattern can be used to make a simple print, cut and play game board. Just follow the instructions in the English Board Solitaire craft project.